It is horrifying to not have a post planned for a day. I have planned posts for all this week, but I didn't plan a post for today. I was struggling all day, trying to come up with a post for today. I didn't come up with one until about 30 minutes ago, and I think all of you will enjoy it. 1.) Josie Maran Argan Oil. I was reading A Hundred Tiny Wishes blog, Tabitha (the blogger) was revieing products from her Birchbox. She received the Josie Maran Argan Oil in her box, and it sparked my interest. I love argan oil! She said that she used it on her face, and I was intrigued by that. I have been looking for a safe argan oil that can go on my face, and I think I have found it! I would love to try this argan oil out myself. I especially love the packaging, and the bottle. It looks like a fancy facial serum. 2.) Temptu Airbrush System. I heard of Temptu from one of my favorite beauty and fashion bloggers, Cara VanBrocklin. When I saw her post about Temptu, I was so mesmerized by a home airbrush system. It would be so fun to use, and so fun to try! When I get married, I am definitely using Temptu to give me an airbrushed look. Temptu has other makeup products that you don't need the airbrush system for, but let's be honest here, the airbrush system is neatest part of Temptu, no? 3.) Naked Palette from Urban Decay. Oh my goodness! This is the palette of all palettes. I so want this beautiful piece of art that can double as make-up. With the Naked Palette, I could do the ultimate smokey eye, the smoldering eye, I could do everything with this beautiful palette. That is why I want it! 4.) bareMinerals BareSkin Pure Brightening Serum Foundation. Ever since I saw this product from BareMinerals, I have been wanting it! I keep seeing the 5 minute makeup tutorials using BareMinerals BareSkin Foundation, and I have been obsessed with it. The foundation brush is so interesting to me. I really want to try this soon, and try those 5 minute makeup tutorials out. 5.) 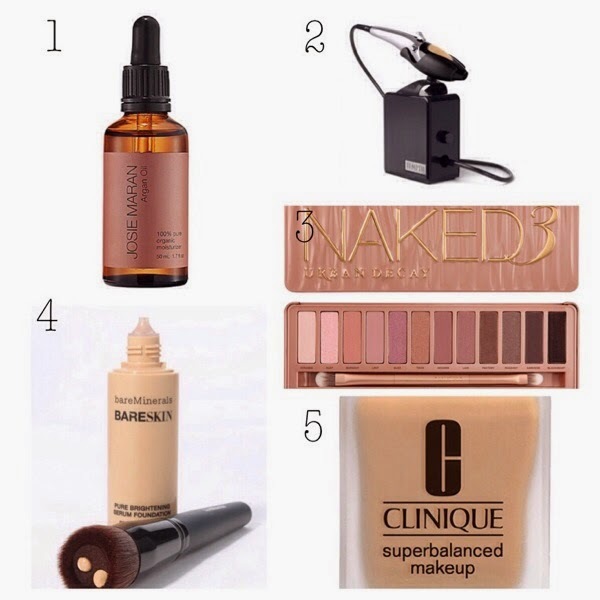 Clinique Superbalanced Makeup. I got together with one of my very best friends, Tara the other day, and she recommended this foundation to me. This is the first thing I am going to check off my makeup wishlist. I am going to grab it soon. She said that she loves it, and it lasts her a while. I know Clinique is an awesome skincare, and makeup brand, and that is why I know that my skin will be taken care of with Clinique. If Tara recommends it, I know it's a good product. I didn't know doTERRA had a skin care line! Is it any good?